Ringing hollow: Louise Jones writes on the subtleties lost in adaptation in Out of Joint and Royal and Derngate’s co-production of Kazuo Ishiguro’s novel. 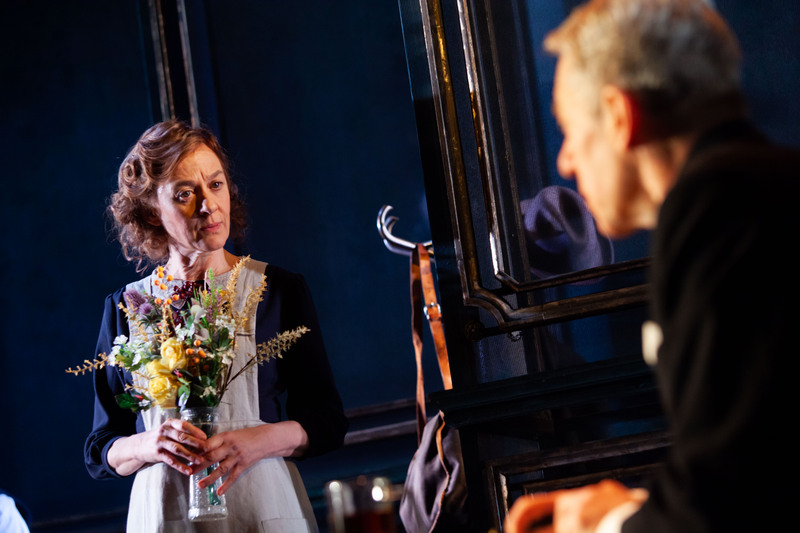 Niamh Cusack and Stephen Boxer in The Remains of the Day at York Theatre Royal. Design, Lily Arnold; lighting design, Mark Howland. Photo: Iona Firouzabadi. At a glance, Lily Arnold’s set design is inspired. The walls of the now-shamed Darlington Hall float eerily across the stage, their see-through panelling adding a ghostly, flimsy quality to this previously-esteemed manor house. The row of bells hangs over the stage throughout, curiously silent. No commands from the drawing room, nobody to run to them. You can’t get the staff these days. There’s only Mr Stevens (Stephen Boxer) left now, who holds a deeper connection with the hall and his previous employer than he would now like to admit. The Kazuo Ishiguro novel that this production is based on (playwright Barney Norris collaborated with Ishiguro) centres on professional butler Stevens’ reluctance to accept senility, both in himself and his father, as well as reframing his employer’s complicity in acts of fascism running up to the second World War. It’s a narrative that twists through Stevens’ inward morality, his reluctance to admit complicity. Of course, that inner turmoil’s always going to be hard to stage, with Norris resting the bulk of Stevens’ moral tussle in his interactions with housekeeper Miss Kenton (Niamh Cusack). Subtleties are lost in adaptation, that’s often par for the course. But then, stories lose their magic when their beats and visuals are lifted and reproduced more literally (cf. Disney’s mystical blue genie, 1992, becomes “why have they made Will Smith blue”, 2019). Yet, despite my firm principle that adaptation should do something new, I felt undeniably underserved by this production. There are certainly the trappings here of something big, proper and immersive. While the house lights are still up, rain pours down Arnold’s panelling; a light illuminates Stevens on the other side, umbrella aloft. The rain continues throughout. It seems wherever Stevens travels (Cornwall, the past), it’s overcast and drizzly, if not outright pouring. The pathetic fallacy feels almost tangible when we’re first met with rain, but its effectiveness and relevance has diminishing returns. By the time there’s a poor cast member stood in the rain throughout an extended scene without any interaction, interruption or meaning, the setpiece just feels like a glorified water feature. What felt inspired now seems pure artifice. Similarly, those bells over the stage. Anticipation fades to resignment, as they never toll in time with the sound effects during transitions. They never toll at all. It gives the set a kind of retrospective emptiness: like Darlington Hall, the set appears impressive, but there’s no interaction within. You can’t get the staff these days. Boxer’s performance is a precise interaction with Stevens’ ongoing struggles; he manages to keep pace with the stuttering nature of flashbacks occurring throughout the show. But Norris’ script doesn’t have the same nuance; he doesn’t so much gingerly handle the themes of the story so much as grasp them by the neck. Coupled with Cusack’s plummy overfamiliarity as Miss Kenton (her enthused “Mr Stevens” are repeated throughout the second act, to the extent they bring Basil Brush to mind), it feels as if the overall show is gunning for a bigger, falser performance than Boxer is giving. No wonder his quietly choked sequence with his dying father is met with titters from the audience: this is a show that’s set up Stevens not as a tragic figure, but one who’s implored for an explanation of “banter” by his new employer. There’s a lot of talk around dignity from Stevens, but not enough fully granted the character. Instead, the show hits more dramatic story beats, reflected in stale set pieces. Stevens walks towards a mirror at the close of the second act, lines from other characters repeating as he confronts his reflection. Or rather, that’s the intent: that air of fakeness means it’s an empty, dawdling finale. All while the SFX goes wild with ringing bells. The bells overhead remain unmoved. The Remains of the Day runs at York Theatre Royal until 23 March, then touring the UK until 25 May. More info here.